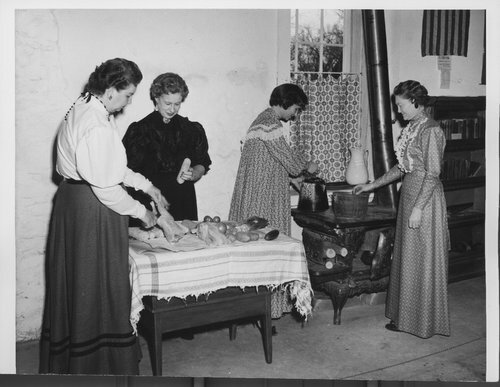 These photos show members of the Fort Larned Belles (in period costume) at the fort, 'preparing a typical pioneer (Kansas) Sunday dinner'. The Belles submitted the menu in a state-wide contest sponsored by the Kansas Press Association for the Kansas Centennial celebrations and won. An accompanying letter gives the complete menu and details of the contest and winners, and identifies the women and the activity happening in each photo. See Text Version below for a complete description of the photos. Additional photos of activities (located in file, Unit ID 216972, catalog # FK2.P1 F.52 Cen.1961 *12-15)) are also described in this letter. Photos were taken by Cliff's Studio.